There are many great books available for the low FODMAP diet as the diet has started to mature and has had a great deal of evidence based research available as well as many personal success stories. Some of these books are from authors who have struggled with IBS in the past and have now found a way to deal with their symptoms using the low FODMAP diet, others are written by leading researchers and health care providers who have seen the effects of the diet with the patients they treat. 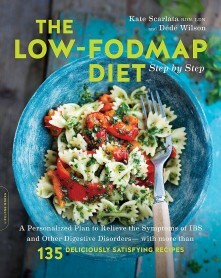 Below you can find a selection of top books that are a great asset to anyone undertaking the low FODMAP diet. The Low-FODMAP Diet Step by Step book is from the digestive health specialist Kate Scarlata and the highly experienced recipe developer Dédé Wilson. 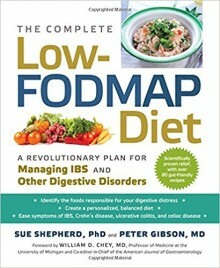 The book takes us through the science of digestion and provides concise and helpful information on the low FODMAP diet. It explains how the diet is split into a three-phase approach which is referred to as Eliminate – Challenege – Integrate. Each phase is fully explained in chapter 2 and the recipes from chapters 5 to 13 have been developed to help with these phases. 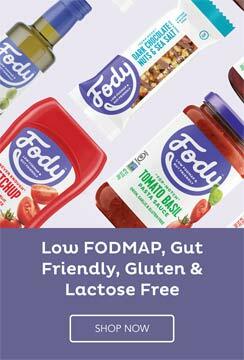 There is a helpful list of high, medium and low FODMAP foods and drinks and a handy Q&A. After learning about what FODMAPs are and the ins and outs of the diet there is a chapter dedicated to the practicality of the diet and you can go about following the diet on a day to day basis. A “7 days of delicious low FODMAP menu plans” is provided with a great selection of meals picked out from the recipes provided. There is even a helpful section for vegans, vegetarians, gluten free dieters and dairy-free dieters who want to try the FODMAP diet. There is some great information on how to succeed in the kitchen showing how to harness the power of various seasonings and ingredients that can help take a bland recipe to making it the meal of the week that your family can’t wait to get their teeth into. These chapters show the vast experience and knowledge Dédé has for food science and is also shown in the amazing recipes provided. The book is full of great recipes beginning from basics such as how to make your own garlic infused oil so you can still enjoy the taste of garlic through to an array of amazing and tasty meals for breakfast, lunch and dinners. There is an abundance of great meal recipes that it will be hard to not find something that everyone in the family will enjoy. Just wait until you get to the mouth-watering dessert recipes that make you forget you are even on the FODMAP diet. 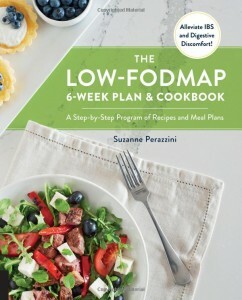 This informative FODMAP diet plan book and cookbook is the latest book from the highly recommended FODMAP diet coach Suzanne Perazzini. She sets out information on the FODMAP in an easy to understand yet full of in-depth information on all areas of the diet. She covers many aspects of the involvement of the low FODMAP diet and good digestive health for IBS sufferers that really makes this a great value purchase. For people who need to consume and take in every source of information on something new then this book handily compiles everything into a great source of authoritativeness. This excellent source of information is provided in Part 1 of the book with Part 2 guiding the reader through the practical aspect of undergoing the low FODMAP diet. Weekly meal plans are provided with recipes to every meal included. There are weekly food diary and journal pages so you can keep a record of your road to recovery. 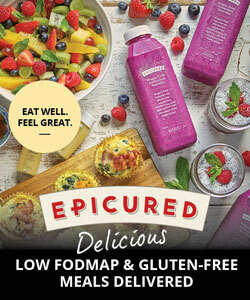 The recipes are tasty and shows you that you can still enjoy food whilst following the low FODMAP diet. The meals would even be great your family so you don’t need to prepare a different meal for other members of the family. This book offers a great deal of help for undertaking a 6 week FODMAP diet but is also a great reference afterwards and offers a great array of recipes to come back to again and again. 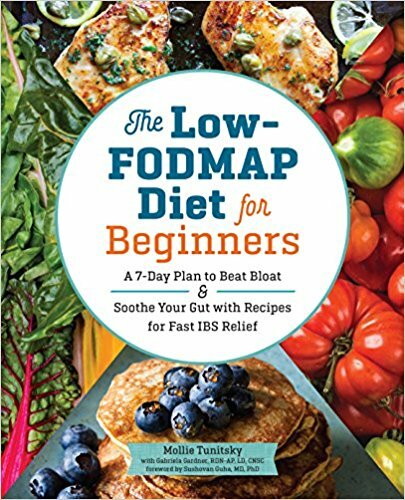 This book is authored by Mollie Tunitsky, a fellow IBS sufferer, and Gabriela Gardener, a Registered Dietitian Nutritionist who has extensive experience of the low FODMAP diet. This partnership is a great mix where both the practical experience of dealing with IBS through the use of the low FODMAP diet is interspersed with the scientific fundamentals of the diet throughout the book. This clearly shines through and offers easy to digest yet solid information. The book is split into clear sections with the fundamentals of the diet being explored as well as a helpful introductory list of foods for the diet. The practicality of the diet is then broken down into 5 steps that offers good advice on how to tackle the diet. A recommended portion size chart offers a good listing of the latest advice from Monash University and a symptom tracker is also provided. The next section offers a guided 7-day elimination meal plan. A shopping list of all the foods and recipes for all the meals is provided. An example of a tasty meal from the book can be found at the Stuffed Red Peppers recipe page. Tunitsky and Gardener provide a helpful FODMAP reintroduction tracker that helps the reader reintroduce foods from each of the FODMAP groups when undertaking the reintroduction phase. The recipes are clear and easy to follow and a good variety of meals is provided to cater to all tastes. If you are not keen on a certain food then there are plenty of other recipes that you can substitute with. There are various tips throughout each recipe to help with substitutions and other tidbits. Lovers of all things sweet and decadent are not forgotten as there are many lovely snacks and desserts offered to make the seven days a treat. The book is a helpful addition to any FODMAP dieters arsenal, particularly to those starting the diet. The diet can seem overwhelming and very restrictive but this book helps to assure the reader that you can still eat happily when following the diet as well as setting you up for your days ahead with significant reduced IBS symptoms. This has been the quintessential book for the Low FODMAP diet for quite a while and it still is the go to book for your knowledge on FODMAP dieting. The book comes from Dr Sue Shepherd and Professor Peter Gibson who are both authorities in the FODMAP and IBS research world. Peter Gibson leads the Monash University team based in Australia that developed and continues to provide valuable research into the the low FODMAP diet. The book starts with providing a general roundup of irritable bowel syndrome (IBS) then moves onto the low-FODMAP diet where a rich source of information is provided starting from the basics to detailing all aspects of the diet. The information provided is very helpful and easy to digest. 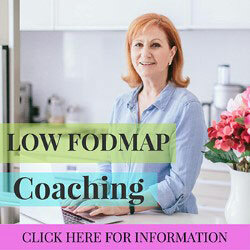 There is a helpful section on putting the low FODMAP diet into practice that provides some great tips. An assortment of meal plans are provided and a chapter is dedicated to making the low FODMAP diet easier as it can be quite daunting for the beginner. The second part of the book provides a wealth of recipes from light meals to soups to pasta dishes and casseroles and more. There are many tempting recipes that help to ease the reader into the diet – many of them will become staple meals that you will makes time after time as they are delicious and not complicated. This book is one of the few books that should be part of your arsenal on your low FODMAP diet journey. You will find yourself coming back to the book referencing information as well as many of the great recipes provided.